Galeria Chełm, a joint venture project of Acteeum Group and Equlis Polska, ultimately completes a circle of its tenants. 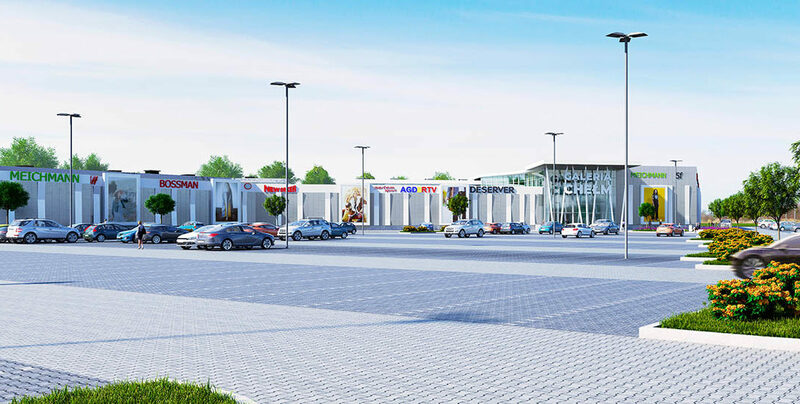 The comprehensive offer of this first shopping center in Chełm will be strengthened by two new dining brands – Olimp and Deli Pizza. Both restaurants will invite customers at the time of the Galeria Chełm opening planned for the first quarter of 2020. Acteeum Group developing the Galeria Chełm project jointly with Equilis Polska, finalized a lease agreement with the owner of the Olimp and Deli Pizza restaurant brands for 2 premises with a total area of 208 sqm. Thus Galeria Chełm will enrich the dining offer with a wide range of popular dishes served by the Olimp Restaurant and a menu inspired by Italian cuisine, available in the Deli Pizza bistro. The newly opened spots will occupy 133 sqm. of space for Olimp and 75 sqm. for Deli Pizza respectively. Both restaurants will be ready to welcome customers at the opening of Galeria Chełm, planned for the first quarter of 2020. – We are extremely pleased that our two leading brands are among the tenants of Galeria Chełm. They are two mature brands that are very popular among customers all over Poland. Chełm is an important location on our expansion roadmap. The decision about our presence in this city was natural for us, the location meets all the requirements we set for our destinations – says Piotr Niemiec, the owner of the Gastromall Group, the creator of both brands. Olimp is the largest and fastest growing chain of fast casual dining restaurants in Poland. It offers the most popular European dishes with elements of world cuisine. The recipes are based on the best seasonal and local products. All dishes are prepared on the spot by experienced Chefs, and the extensive menu, variable during the day, allows to independently compose a complete meal. Vegetarian and vegan options developed in cooperation with the “RoślinnieJemy” campaign are also available daily. All drinks – homemade compotes, lemonades, cocktails and vegetable and fruit smoothies are prepared on site. In Olimp restaurants the guest decides what dishes and in what quantities will be on his or her plate and pays a uniform price for 100g of food. Thanks to this, customers are having full control over the bill and it takes only a moment to wait for a meal. The Olimp restaurant chain currently has several dozen restaurants around the country and is constantly growing. Thanks to the loyalty Client Card, everyone can enjoy attractive rebates on meals. Olimp restaurants also offer discounts for students. More information can be found on the website www.olimprest.pl, the blog with recipes and advice of the Chefs www.kulinarnydoradca.pl and on the Facebook profile at: facebook.com/restauracje.olimp. Deli Pizza was created for those who love pizza. At Deli Pizza, each pizza is composed by the customers. The order takes a short moment and the pizza with your favorite ingredients is ready in 3 minutes. Just add fresh basil or rucola, a drop of olive and pick up the ready dish. The guests can also rely on us and order a pizza we composed – it’s simple and convenient. Galeria Chełm on the area of 17.5 thousand sqm. will offer 55 commercial premises and over 550 parking spaces. The plot on which the new shopping center will be located at the junction of Lubelska and Rejowiecka streets (also constituting the Chełm beltway), in the major transportation hub of the city. The Galeria Chełm’s catchment area covers nearly 300,000 residents as well as the cross-border traffic with Ukraine and Belarus. Among the tenants that will open their stores in Galeria Chełm are already such known brands as Lidl, CCC, SMYK, Rossmann, RTV Euro AGD, Martes Sport, Reserved, Sinsay, House, Cropp, home&you, Pepco, Diverse, Swiss, Ziaja or Księgarnie Świat Książki. The commercialization level had already, a year before the grand opening, exceeded 75%. Galeria Chełm grand opening is planned for the first quarter of 2020. Equilis is a real estate development company founded in 2006 by Carl Mestdagh with the assumption of operating on the Belgian real estate market. Currently, Equilis implements and supports ambitious commercial, residential, office and revitalization projects, senior homes, dormitories as well as entertainment, cultural and public undertakings. Equilis has so far completed commercial projects with a total area of 250,000 sqm. and 757 residential premises, and under construction or preparation has another 230,000 sqm. space for rent and 2,832 apartments. Acteeum Group is a privately owned international company operating on the commercial and residential real estate market in Poland, undertaking the entire development process, starting from selecting suitable plots for development through the stage of design, construction, commercialization, management and sale of facilities. The Acteeum approach to projects is based on extensive experience and knowledge of the polish market and the development process. The company is a business partner of large institutional companies, including CBRE Global Investors, Immofinanz, NepiRockcastle, Equilis as well as private investors. Acteeum focuses on the development of large scale retail facilities and residential projects. Acteeum manages a land portfolio and negotiates the purchase of further plots for the construction of shopping centers, retail parks, residential developments as well as mixed schemes.